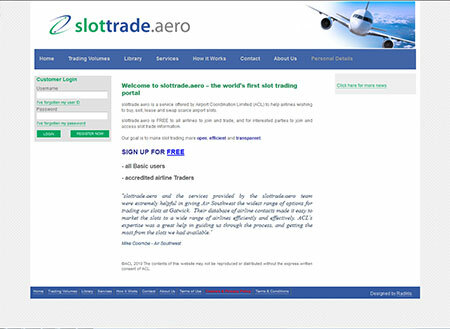 Slot Trade is a service offered by Airport Coordination Limited (ACL) to help airlines wishing to buy, sell, lease and swap scarce airport slots. The process of trading airport slots in the past was a more manual experience, in which airports would contact other airports via phone or email in order to swap. ACL wanted to create an online space for airports to trade slots in a more efficient and contemporary manner. ACL contacted Radikls in 2010, requesting for an online trading space which Radikls delivered. The site, slottrade.aero, gives airports the opportunity to manage slots and allow for airports to buy, trade or post up available slots on the site through Radikls’ effective e-commerce system. Radikls have incorporated a subscription-based system and has made the process of trading slots a more time effective and efficient process. Slot Trade can now keep airports up to date with any slots that are available, with tools such as SMS and Email messaging. Searching for slots has also been streamlined, enabling the matching slots to an airport's specific specifications. Radikls have helped Slot Trade become more efficient allowing for ACL to invest their time in other key areas.